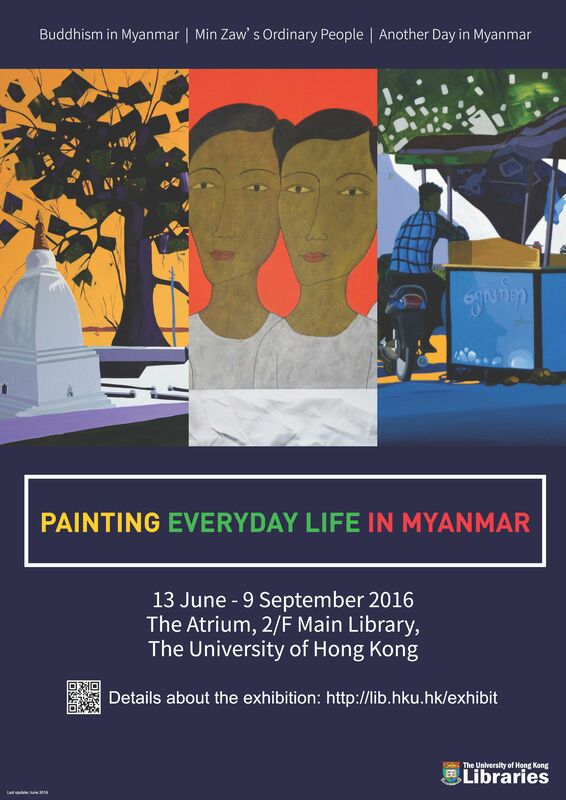 The exhibit of 15 paintings, displayed in the entrance lobby of the Main Library, was structured around three core themes: Buddhism in Myanmar; Min Zaw’s Ordinary People; Another Day in Myanmar. 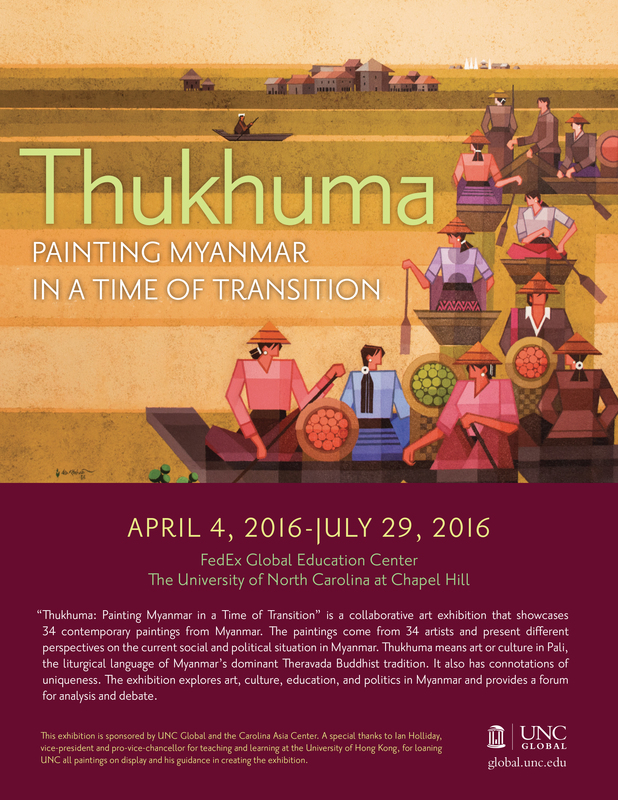 From April 4 to July 29, 2016, the FedEx Global Education Center at the University of North Carolina at Chapel Hill kindly hosted a four-month exhibit of Myanmar paintings. 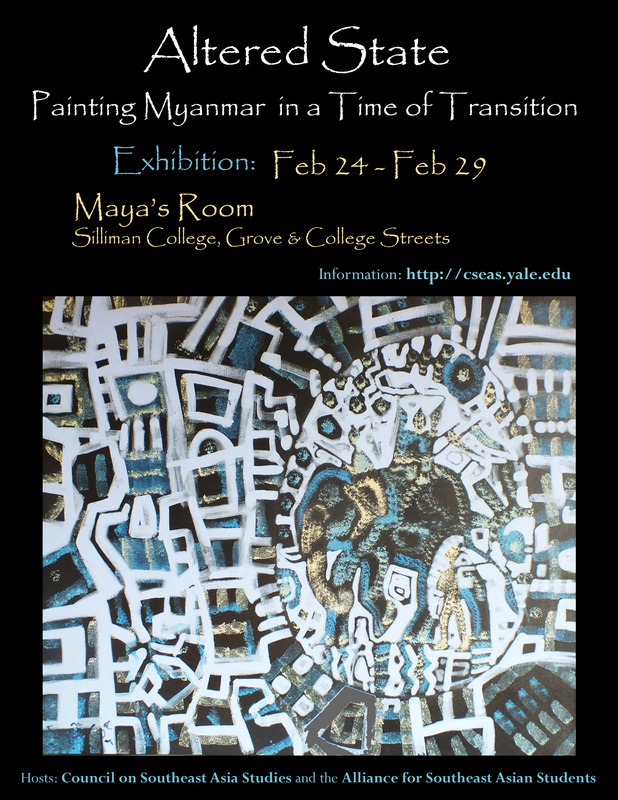 On February 24, 2016, the Council on Southeast Asian Studies and the Alliance for Southeast Asian Students at Yale University kindly launched a one-week exhibit of Myanmar paintings. On February 4, 2016, Harvard University Asia Center and the South Asia Initiative sponsored the launch of an exhibit designed subsequently to tour many US campuses. 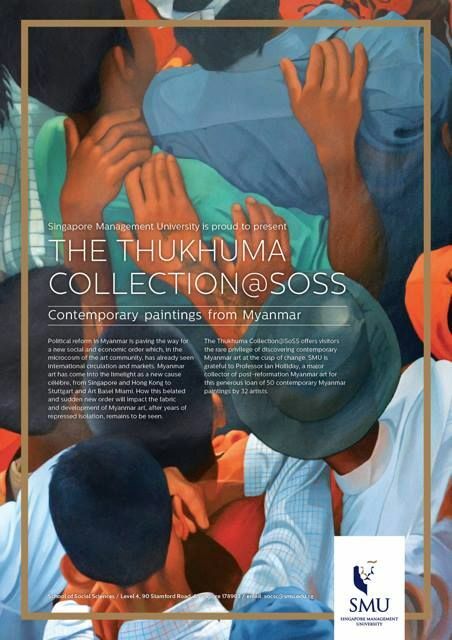 This contributed to the core aim of the Thukhuma Collection of using paintings to explore art, culture, education and politics in Myanmar. 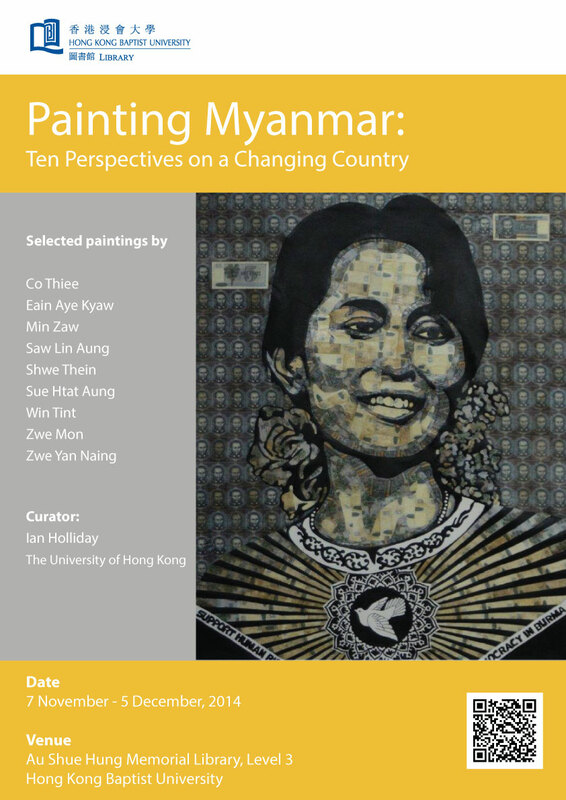 On September 3, 2015, the School of Social Sciences at Singapore Management University launched a five-year residency of 50 contemporary Myanmar paintings by 32 artists. All are drawn from the Thukhuma Collection. The exhibit was curated by Joanna Lee. Political reform started to sweep Myanmar in 2011, when a long-standing military junta handed power to an elected civilian government. While many big issues still need to be confronted, the country is visibly changing as people become more free. 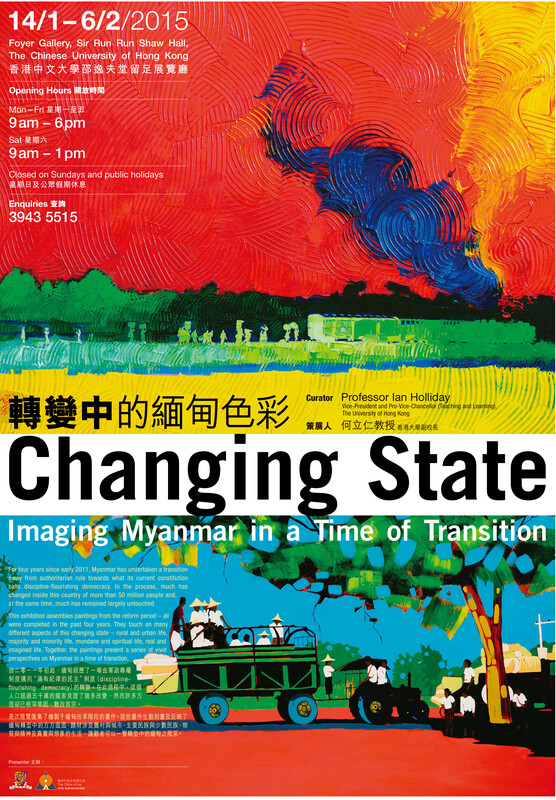 This exhibition provides one set of perspectives on Myanmar in reform by presenting paintings by about twenty artists. Together, they help generate a fuller understanding of a nation that for decades has had only limited contact with the wider world. For four years since early 2011, Myanmar has undertaken a transition away from authoritarian rule towards what its current constitution calls discipline-flourishing democracy. In the process, much has changed inside this country of more than 50 million people and, at the same time, much has remained largely untouched. This exhibition assembles paintings from the reform period – all were completed in the past four years. They touch on many different aspects of this changing state – rural and urban life, majority and minority life, mundane and spiritual life, real and imagined life. 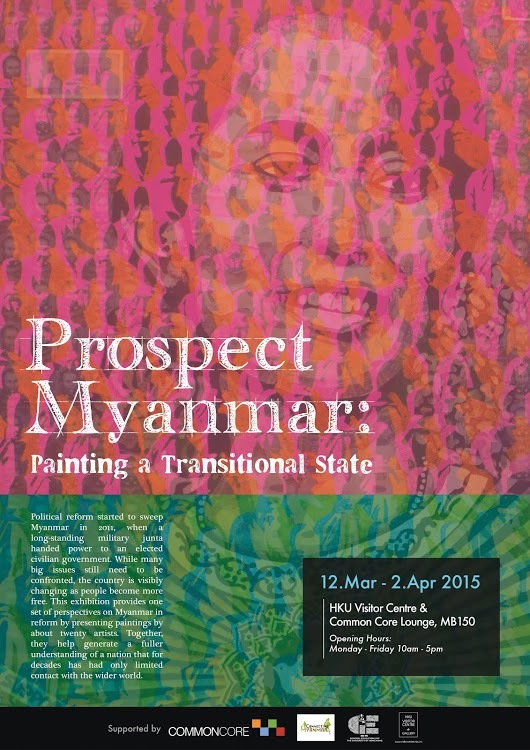 Together, the paintings present a series of vivid perspectives on Myanmar in a time of transition. For 50 years Burmese painters labored under strict state censorship. This exhibition will feature paintings produced under military governments from 1962 to 2011 and in the aftermath of the March 2011 transition to civilian rule. Visitors will enjoy a rare glimpse into the cultural community and mindset of artists operating under the mechanics of censorship. 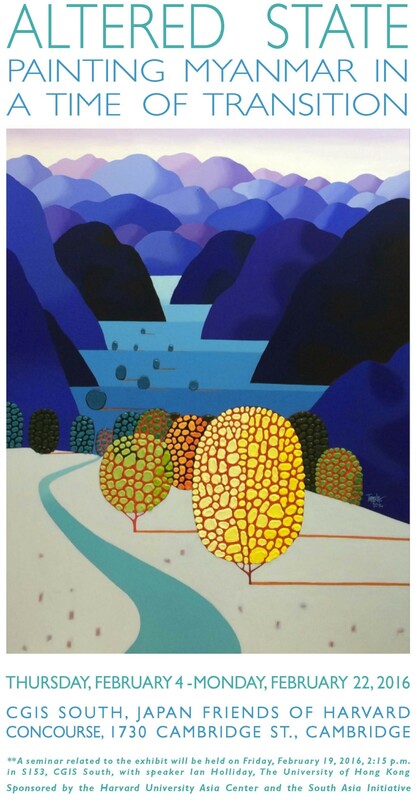 For many painters, this will be the first international exhibition of their work. Myanmar’s politics and economy has been military dominated for some 50 years. With that weight now somewhat reduced, the country is in a state of rapid change. What are the opportunities and challenges? What does reform mean for markets and politics? How will poverty, inequality and rights be addressed? In this Workshop, four leading experts assess these questions and Myanmar’s future. 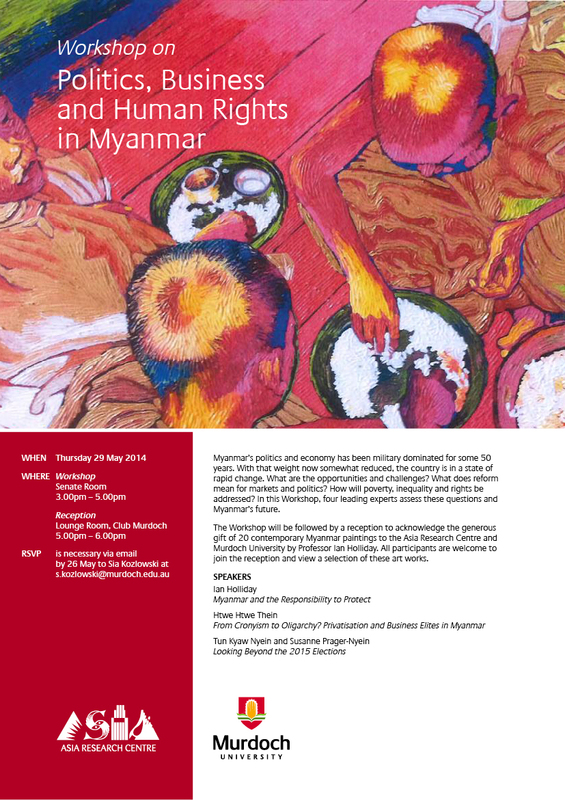 The Workshop will be followed by a reception to acknowledge the generous gift of 20 contemporary Myanmar paintings to the Asia Research Centre and Murdoch University by Professor Ian Holliday. All participants are welcome to join the reception and view a selection of these art works.